2015 marks the 200th anniversary of the Battle of Waterloo. Find out how the battle’s fallen soldiers contributed to the grim world of 19th-century dentistry in this blog from Senior Human Osteologist Don Walker. We know from documentary and archaelogical sources and skeletal evidence that dental disease was common in past populations. One of the consequences of this was early teeth loss, resulting in problems eating solid foods. Before the late 19th-century, false teeth were prohibitively expensive for all but the wealthy. Even then, dentists struggled to produce functioning replacements, resulting in the manufacture of false teeth that were considered acceptable to view but were not effective for chewing. The search for visually pleasing dentitions led to the use of actual teeth to replace those lost, in order to produce a more natural looking smile. The new teeth could come from living donors or, more chillingly, taken from the mouths of the dead. In particular, dentists were known to buy the teeth of body-snatched corpses. Once retrieved the teeth could replace those missing from a living person. Various methods were used, including filing down the root and then drilling a hole in its base to enable it to be fixed to an ivory prosthesis. This meant that teeth became a valuable resource, so much so that people are known to have gone out scavenging for them on the battlefields of France. This is where the term Waterloo teeth originated. The relatively good condition of young soldiers’ teeth probably inflated demand. However, the practice came with connotations of grave robbing, a very sensitive subject in the first half of the 19th century. 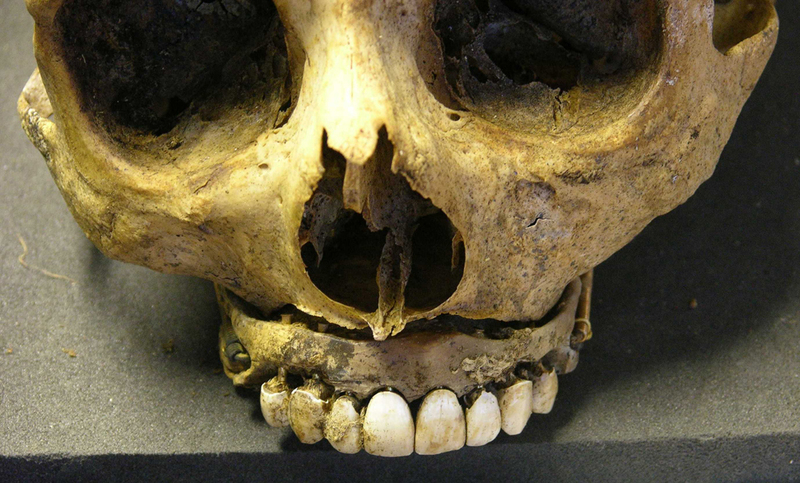 The dental prosthesis pictured was found in the grave of a 19th-century adult who died between the ages of approximately 36 and 45 years of age. They had suffered dental disease to such an extent that they had lost all their teeth, but were wealthy enough to afford a new set. The dentures consisted of an upper jaw (maxillae) of human teeth fixed by metal pins to an ivory base. The presence of such teeth and their associated prostheses could cause irritation and inflammation in the mouth. This compromised dental hygiene and hastened the onset of gum disease, no doubt leading to foul smelling breath. The introduction of hardened rubber vulcanite dentures in the late 19th century ended the need for Waterloo teeth. What we are left with are the artefacts, like these spectacular dentures. They can give us invaluable information not only about the Battle, but its impact on society. There are a host of upcoming events commemorating the Battle of Waterloo. For more information visit the Waterloo 2015 website.